The new award is an extension of the industry’s platinum, gold and silver awards scheme, which since April has been certified by The BRIT Awards as well as the BPI. Sheku’s Inspiration is 2018’s top-selling classical album in the UK and has sold more than 100,000 albums worldwide – a major milestone for any artist and an astonishing feat for a classical debut. As well as a main Top 20 appearance and spending 13 weeks at the top of the UK classical chart he has reached the classical summit in the US, France, Australia and New Zealand. In the US, he has also topped Billboard’s Emerging Artist chart – the first classical musician ever to do so. 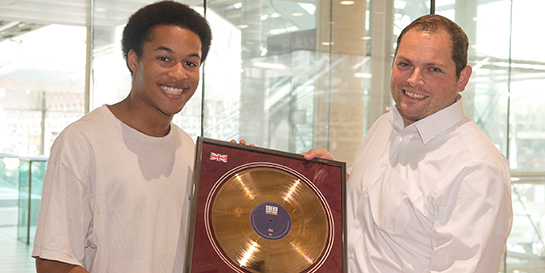 Sheku has been on a whirlwind adventure in the two years since garnering public attention as winner of BBC Young Musician 2016 and signing to Decca. He has performed twice at the BAFTAs, played at 10 Downing Street for the 30th anniversary of Black History Month, made his Carnegie Hall debut and notched up several high-profile TV appearances alongside his busy international concert career. His biggest profile-boost came in May when he played at the wedding of the Duke and Duchess of Sussex, an extraordinary opportunity which has catapulted his debut album to worldwide success. Sheku’s extraordinary year continues to be filled with exciting live performances around the world, including dates in the US, Switzerland and France. He recently performed at the BBC Proms at the Royal Albert Hall, just weeks after picking up two Classic BRIT Awards at the same venue. He is still studying at the Royal Academy of Music and has a passion for making classical music accessible to all as the junior ambassador for the music education charity London Music Masters.